The Satanic Temple promotes ‘religious pluralism’ by displaying a demonic statue in Little Rock. On the state capitol grounds in Little Rock, Arkansas, stands a monument commemorating the Ten Commandments. On August 16, a demonic, goat-headed statue stood beside it for a portion of the afternoon. This occurred during a rally by the Satanic Temple organization, which claims it has a First Amendment right to display a statue of Satan. A new Ten Commandments monument was installed at the capitol this year after the previous, identical monument was smashed when a man sped his car into it in 2017. Last year, the Satanic Temple petitioned for a statue of Baphomet, the demonic symbol of its organization, to be installed alongside the Ten Commandments monument. Its petition went unanswered. 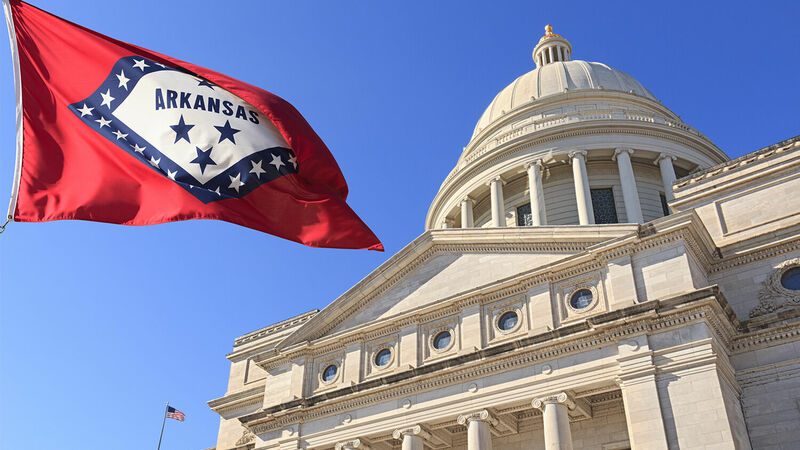 It plans to sue the state of Arkansas for violating its religious rights as guaranteed under the First Amendment. That is what the August 16 rally was all about. The rally was attended by about 150 people as the statue was brought to capitol grounds and temporarily unveiled. Not everyone at the rally supported the Satanic Temple’s actions. A group of Christian counterprotesters stood off to the side, holding signs bearing Bible verses and singing hymns. In 2015, Satanic Temple members petitioned the state of Oklahoma to erect a statue of Baphomet at the state capitol, where a Ten Commandments monument was displayed. Oklahoma refused, but the attention encouraged the courts to rule that the Ten Commandments monument was unconstitutional. It was removed later that year. After this, the Satanic Temple had no more interest in Oklahoma City: It had successfully removed the Christian symbol of the law. This is exactly what members of this self-described “nontheistic religion” are trying to achieve in Arkansas. Members of the Satanic Temple are largely atheistic and agnostic. The organization does not believe in a higher authority but in the mentality of the “eternal rebel,” which is why it took on the name of Satan. It makes its claims of religious discrimination in the name of the First Amendment, yet its own publications promote rebellion against authority. This is an organization literally waging a war on law, attempting to remove the Ten Commandments through twisting the meaning of a law that it rejects. This is an extreme example, but this plague is infecting more and more Americans. Few may be trying to set up statues of Satan the devil outside of government buildings, but many fervently hold the view that the government must be secular, atheistic and certainly not based on the Bible. Consider some statements from the Founding Fathers. In his first inaugural, President George Washington said, “The foundations of our national policy will be laid in the pure and immutable principles of private morality.” And in his famous farewell address he said, “Of all the dispositions and habits which lead to political prosperity, religion and morality are indispensable supports.” Without religion and morality, Washington knew the American experiment was doomed to fail. John Adams backed him up: “Statesmen may plan and speculate for liberty, but it is religion and morality alone which can establish the principles upon which freedom can securely stand.” Religion and morality are firmly rooted in divine law. What political or religious leaders would make such statements as these men did? Even the politicians who established our republic were more spiritual than most of our religious leaders today! The Constitution is the foundation of our republic. And the Ten Commandments were, in many ways, the foundation of the Constitution. Our forefathers believed that if we didn’t keep God’s Ten Commandments, our republic would collapse! America was built on a foundation of Bible-based law. And now we are abandoning that law. What happens when we abandon the law? Read that last sentence again: “Our forefathers believed that if we didn’t keep God’s Ten Commandments, our republic would collapse!” That is exactly what we see happening today. Our people and our leaders have disregarded the spiritual principles this country was based on. And in large part, they have also disregarded the laws upon which our country was founded. The Constitution is being altered dramatically. And it is the foundation of our republic! We are experiencing a constitutional earthquake, and most of our people don’t even know it—yet. Your future is being changed for you, and often you have no input. This process is sure to lead to anarchy! That is why you and I should be deeply concerned. Law scholars today don’t believe the Constitution was “rooted in objective and unchanging truth”—that is, they don’t believe our founders established the rule of law. But that’s just what the founders did. And now most lawyers and judges reject their foundational work. Our views today reflect a deadly degeneration into lawlessness! Our political leaders today are resisting and defying the Constitution, the supreme authority of the land. What does that say about who is inspiring such actions and mindsets in human beings? What does that tell you about where our society is headed? The Satanic Temple previously caused the removal of a Ten Commandments monument from the capitol grounds of Oklahoma, and it is now attempting to do the same in Arkansas. Satan himself is removing the rule of law in the United States! But as Mr. Flurry wrote, “[T]here is good news. The Bible clearly shows Jesus Christ’s Second Coming occurs at a time when lawlessness prevails. Christ is about to return, and our lawless society is evidence of that fact! When He does, the wonderful rule of God’s law is about to be established forever!” (ibid). Mr. Flurry exposes our political leaders’ utter lack of respect for law in his booklet America Under Attack. To understand more on this subject, please order your free copy.